Here’s a quick and easy way to enhance your voice and create the best vocal tone possible! It’s called, "The Warm-Up Studio™!" Fully produced with original music and sound effects. This is not your typical vocal warm-up. We don't run scales!!! Do this warm-up routine BEFORE you sing scales. 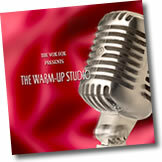 The Warm-Up Studio™ is a four-part vocal warm-up routine designed specifically to warm up the voice. The routine helps artists produce a warm, clear, resonant tone. If you’re a performer, actor, speaker, singer or use your voice for long periods of time, then "The Warm-Up Studio™" is for you. Some people who use their voices professionally may not realize the importance of warming up before speaking, singing or performing. Just as an athlete warms up his/her muscles before a race, a performer should take a few minutes to warm-up all the components that create a great voice - the body, the articulators, the mask and of course, the vocal folds. Many actors and singers are trained to do some type of warm-up, but often times their routine is ineffective. The Warm-Up Studio™ is easy to do and you'll hear and feel immediate results in your voice. Sometimes stress and anxiety can get the best of any performer. Research shows that there are several causes for anxiety in performers which may include fear, tense muscles, physical, or other health-related challenges. Any of these issues can make performers feel they can’t depend upon their voices which also increases the level of anxiety. With any of these symptoms, the blood pressure goes up, the heart rate increases; perspiration pops out of the body, and it may become difficult for you to breath. Of course as a performer, you can't voice a clear tone without proper breath support. I've watched performers try a variety of things to alleviate stress like trying to talk themselves into calming down, relying on friends or family for support, crying, screaming (truly not good for your voice), perspiring, wringing hands, pacing, snapping at others, panicking, and refusing to perform. All of which can be extremely detrimental to your careers, little of which actually helps the problem. No matter what form the anxiety takes, tension and stress can really wreak havoc on the voice causing all kinds of problems … even problems that lead to long time voice disorders. The confidence that comes with being able to rely on your voice in the most stressful times is invaluable. Let "The Warm-Up Studio™" help you do your best. Here is a sensible, easy-to-use, relaxing way to enhance your voice. ...all the components that allow you to produce great vocal tone in a very relaxing yet invigorating routine. And, in less than 20 minutes. The Warm-Up Studio can relieve stress, reduce pain, lower high blood pressure, slow down a racing heart, and completely relax and energize you. What's in The Warm-Up Studio™? In the first exercise, you get the benefit of relaxing and calming the body down. The program leads you through a simple, but effective way to breathe perfectly - which is the foundation of good vocal production whether you're singing or speaking. As you follow along, you'll be able to relax tense muscles, which has an immediate effect on the voice and of course reduces stress. In the second exercise you'll warm-up the articulators, which include your lips and tongue. This exercise is a new twist on you're A-B-C's which also produces immediate results. In the third part of the routine, you'll warm-up the mask - the area around your nose, mouth and chin. This is another light-hearted approach to breathing, which is guaranteed to make your lips move more easily aiding articulation and pronunciation. Forming words becomes much easier. The fourth and final exercise warms up the vocal folds. It takes some practice but is really helps you produce a warm, clear, resonant tone. This part of the warm-up makes singing effortless, allowing the tones to float out of a relaxed and energized body... one that's been "warmed up." This exercise shows you how to produce a strong tone using your body and not relying on the throat, vocal folds and tense muscles to produce a sound. The Warm-Up Studio's™ easy four-part routine takes less than 20 minutes and can be done anywhere...in your car, your home, or back stage. Don't neglect a good vocal warm-up…. it's critical to producing a clear, strong and resonant tone. Your confidence will soar when you hear the tone and feel the ease of vocalizing with this simple routine. 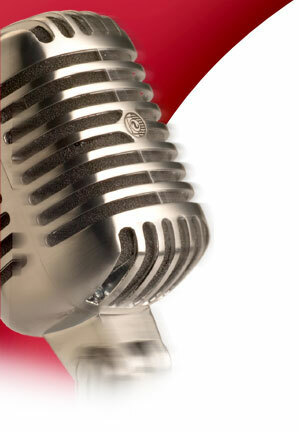 Eliminate stress, tension and build a great voice with "The Warm-Up Studio™."